Shortly after I found out I was pregnant for the second time, I started to research childbirth more in-depth. Knowing that my first birth experience was a challenge, to say the least, I knew I had to do something different this time. Once I learned what a doula’s role was, I knew that was what I needed to make the difference for me. Read more about why to use a doula here. I searched for local doulas, and did a few interviews and found the perfect one for me, Liz Griffin. 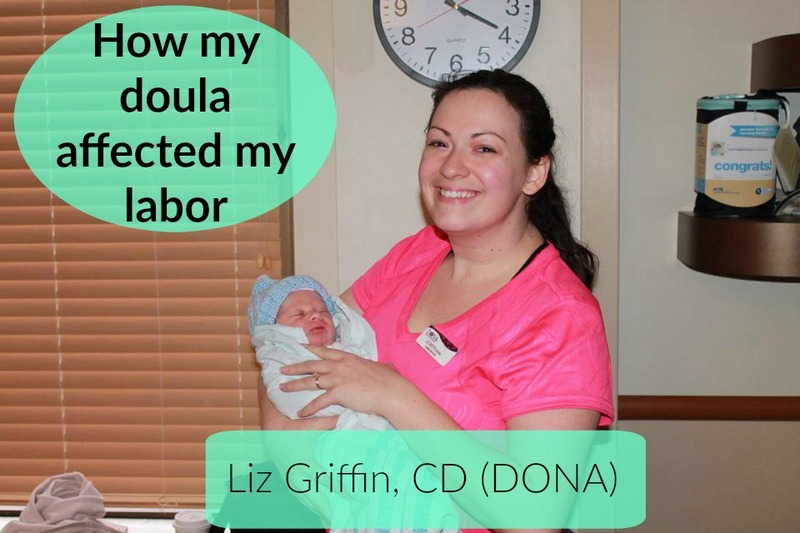 Read more about my search and why I chose Liz Griffin to be my doula here. Hint: Cause she’s awesome! As soon as I chose Liz to be my doula we kept up with one another regularly by e-mail and text. She even reached out to me a couple of days after having her own son! I felt very comfortable with her right away. Which is important, being that she would be by my side during one of the most vulnerable times in my life. We first met 4 times in person – once during our interview getting to know one another, then again at a prenatal meeting when we discussed the details of my ideal birth, obviously during my labor, and then again at a post-birth follow-up. We spoke frequently in between these meetings also. I asked her about questions I had that I would’ve asked the doctor, but didn’t have to wait for appointments. Things that could easily be embarrassing to talk about, like mucus plugs and bloody show, were no problem for Liz. I really valued her input not only as an experienced birth professional, but also as a 3-time mom. I was able to process fears and concerns with her, like had I chosen the right doctor for the type of birth I was planning on, where I should leave my son while I was in labor, and explain the amenities of the hospital. Liz was always honest and supportive without being judgmental. She kept things lighthearted and made me giggle, which I appreciated. She asked how I was feeling, and towards the end of the pregnancy she checked on me daily. I always kept her up to date with developments and told her about my weekly appointments. Read more about my labor here. I’d been feeling contractions on and off for a few weeks prior to labor. Nothing became stronger or more regular, so I knew they were Braxton-Hicks contractions. But on the morning of July 25th, I awoke to a new and frightening sight and texted her immediately. She suggested I give the doctor a call when I told her I’d woken up bleeding that morning. After a trip to the triage room at the Labor and Delivery department, followed by a sharp drop in baby’s heart rate, I was admitted to the hospital. I am so thankful she encouraged me to make that call! I later learned I may have had a placental abruption, which could potentially be life threatening – for both baby and me. My husband used my phone to text Liz, and even though I hadn’t started contracting yet, she reminded us that labor with baby #2 can be unpredictable and asked if she could come meet us there. I really appreciated her initiative and willingness to join us during an uncertain time. She was patient, waiting with us while I was confined to bed and not showing signs of labor – it could have been boring, but she kept it interesting. We YouTube’d a video of Kid President and joked about episodes of The Office. 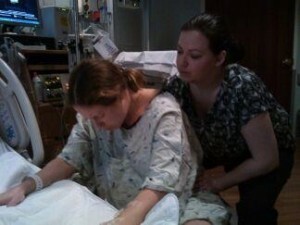 During labor, it’s easy to feel uneasy and unsure because it’s a very intense event for which you cannot fully prepare. These feelings can be overwhelming, especially during your first birth; but they often continue through to the birth of subsequent children, because no two are alike. Even without me being able to move much, Liz was the level-headed presence I needed in the delivery room. She inspired me when I was feeling defeated. She reassured me at my cervix checks. Emboldened me by telling me what a wonderful job I was doing. She encouraged my husband to hold my hand and be involved throughout the process. Liz was very considerate, using kind words and gentle touches. I recall at one point, when I’d broken down into tears, she rubbed my shoulders and, while I don’t remember the exact words she used, remember the impact her compassionate remarks had on me in that moment. It was perfect. During our prenatal meeting, we discussed how I would like to use multiple implements, like a birthing ball and a shower during labor. We discussed changing positions every thirty minutes, as well as, alternating between active and passive activities so I wouldn’t get worn out too quickly. Our plan was wonderful, but the best laid plans of mice and men often go awry! Unfortunately, she wasn’t fully “able to shine” as my husband described it. Her opportunity to use all the physical tools (i.e. getting up and moving around, not hammers and wrenches!) in her metaphorical toolbox was cut short, being that for a large portion of my labor, I was restricted to bed. She was very helpful in giving me specific instructions during pushing that allowed me to be very effective in my pushing. As a testament to her guidance, know that the pushing phase went by quite quickly – under 10 minutes! Once my son was born, Liz was encouraging of breastfeeding and gave me guidance on latching and burping the little one. She took some priceless photos for us of the moments before, during, and after he was born. Another thing that is very valuable to us is the written birth story she presented us with at our follow-up meeting. My husband and I were both were moved to tears reading it. She replied to my (probably constant) texts in the days after my son’s birth as I was having a hard time sustaining our breastfeeding relationship. Liz was very encouraging and understanding, celebrating tiny milestones with me. She recognized their importance to me and was supportive the whole way. I would highly recommend hiring a doula, namely Liz, to any pregnant woman. Some people believe doulas are only for first time moms, or those planning on a natural birth. While I believe doulas are valuable in both of those scenarios, their assistance is certainly not limited to just those instances! All women can benefit from having an experienced birth professional by their side during birth. Nurses and doctors will be in and out and focused on many other things, rather than just you. Having Liz by my side during labor was essential to my positive birth experience. Meeting with her beforehand allowed me to process my previous labor, and consider how I wanted this one to be different. The questions she asked me prompted me to continue researching, watching documentaries and shows, and reading about all my birthing options. That additional knowledge have me confidence, as well as having been through labor once before. Mostly, it gave me confidence just knowing Liz was there. I cannot recommend Liz highly enough. 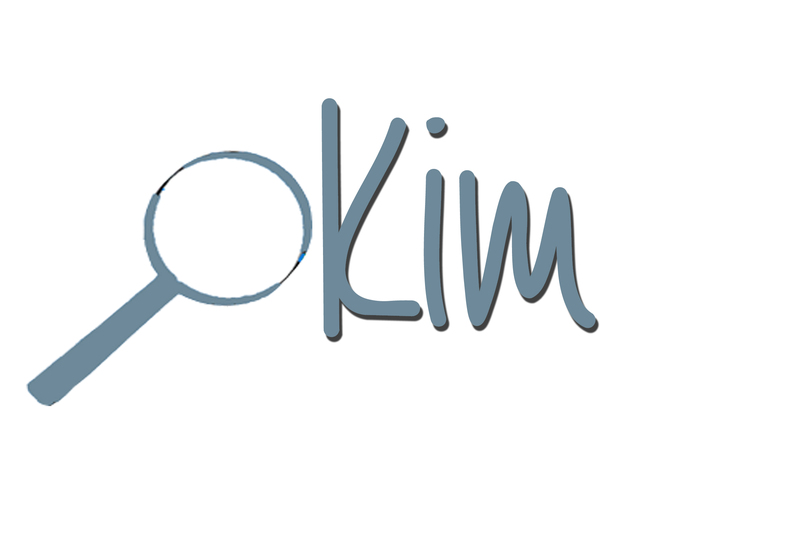 If you’re pregnant in Hampton Roads, I encourage you to reach out to her and see how she can help you. Tell her Mom Explores Virginia Beach sent you!